Got the saddle all oiled and put together but I am not happy. It came out much darker than I expected. I used different leather this time, good leather, but from a different tannery and it must have took on the oil much easier. Any way, that ain’t all of it, my camera won’t take pictures now with out wavy lines in the pictures. Hopefully it is just a low battery. Here’s a picture of the saddle, but not a very good one and it is so dark you really can’t see all the work I went to in the carving!. Arrrrgggggg! Had a nice visit with a feller from over by Aberdeen, who has Clyde’s. He asked to see some pictures of my bale unroller. So here they are Ryan, along with a few others. Click on the pictures to make them bigger. Here’s the poem Ryan. feel free to copy it if you like. I couldn’t make it copy and paste to an email, so decided to post it here. I don’t have to plug them horses in just so they can go! And I’ll leave them ol’ tractors to them as don’t know as much! I went into the doctor yesterday for several little things, then on to Rapid. got some wood pellets. Decided I’d put my money where my mouth is and get some as I think we still have some cold weather to deal with. they will save if we don’t just take up room in the little red shack. Then I went to a meeting of the GF&P commission about the new tags for elk for this fall. I was pretty sure it was going to be good as we are way down on numbers of elk and most people think the lions are the problem. They got over 70 lion this late winter in 70 days. With hardly any snow. And no use of dogs. So most people figure there are way more lions out there than the GF&P is accounting for. Lots of people walked up to the mike and had their say and they limited their time to 3 minutes. Most didn’t need it. Most said, less to no cow tags and lots more lion tags. A few want to see an open season until it is hard to see or find a lion and get these numbers corrected. One lady thought they ought to quit hunting lions as they are just wonderful little kitty’ kitty’s and really do no harm.Several people cussed the landowners for always getting a elk tag. I guess they figure just because a rancher feeds them all year he shouldn’t get any better deal than any one else. Seems to me like those that feel that way should just go buy a ranch and run some elk, so they’d always get a tag. Most landowners testified that they hardly see any elk now as compared to numbers just a few years ago. Puzzles me, why they worked so hard to get an elk population and then the lions eat them . The commission has a tough job and many were angry with them and the GF&P. Face it, folks was perturbed. I got to meet and visit with the head guy of the GF&P and I know one of the commissioners a bit. Saw several people and talked to them who I have only met on line before. One problem that came up is the lions are eating almost all of the calves born in the spring. For several reason. I think some good ideas came out of it and it was worth the drive to watch. Hopefully these people will get at least some of what they want. Oddly, Wind Cave Park is right next to Custer State Park and Wind cave has too many elk. but then, they don’t allow hunting, but they do have their fence set up so elk can leave and not get back in until after the hunting season. Seems to me like they could just drive some elk over into Custer State park, but then, I am sure there is a reason the Elk don’t want to go to Custer State park and I think it is because there is less open ground, more tees, so less feed and better for the lions. I don’t think elk are all that stupid. they are going to stay or go back where they have feed and fewer predators. It was brought up by several people that there are wolves out there, something most of us dread, after watching what the eco tards have done with their lying ways about the wolves that started in Yellowstone and have now spread out across the west in much larger number than were promised. They wanted 125 or 165 wolves and their are hundreds now, maybe thousands, yet they fight the hunting or trapping of wolves every where. Just like they fought all the tree cutting in the Black Hills and now we have a huge bug problem and trees dying all over. Wish we could get a lawyer and sue all these groups like Friends of the Forest, the Sierra Club and the like. They have caused this problem and now we all have to pay to try and fix it. Mother Nature will take a big hand as we have dry years and many trees will burn and then there will be a great outcry that we are burning down the forests. Look at what just happened in Colorado. And all those who have built in the timber will scream because their houses will burn. Face it as a whole, people are stoopid! It was real nice this morning but then a south east wind picked up this afternoon and it’s really blowing now. I got the cows fed then truned the horses out and loaded Tank up and hauled him to the vet to get gelded. the vet was gone when I got there so I just left him and went on down to Phillip, ate some lunch and then on and waited at Kadoak for Marty. He cam about 2:45 and I got the Blue horse back and then back to the vet’s. Got Tank back and then on to Eric’s where I picked up a colt he has been training on, Pard. Blue and Pard will go to Chance, sounds like. Maybe just Blue at first and after he needs another one, then send Pard on, unless I fall in love with him in them mean time. They both need their feet trimmed. Must be that I ain’t the only one who doesn’t like to trim feet! No colts worked with today, other than the ones I hauled. Oh well, there is always tomorrow. Finished up the cantle binding on the saddle last night. 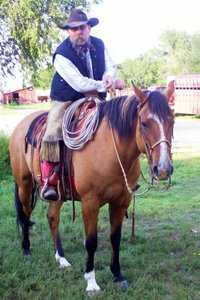 Now to polish and smooth and put concho’s on, pull down the strings and oil it and rig the latigo’s and stirrups and it’s ready to ride. I’ll post a picture when I get it all done and ready to go. That ol’ wind picked up last night and with it came thunder and lightning. Started at least a couple fires in the area. One big one out on the gumbo. Sounded on the fire radio like thy had lots of trucks, but were having trouble getting to the fire. It’s rough country and summer range and it’s always hard to find your way around in the dark. At least one truck got stuck. Found a soft wet spot. There was evidently just enough rain came with the storm to make the gumbo sticky. I turned the radio on this morning but didn’t hear anything, so between the trucks and the rain, they must have gotten it. Luckily, only one person lives anywhere close to where it was and there was a water course between the buildings and the fire, but as hard as the wind was blowing, it probably wouldn’t do a lot of good. We got maybe 15 hundreds or even a quarter inch. Not a lot, but more than we had. Wind blew pretty stiff today. When I rolled out hay the wind caught some of it and blew it into the fence line. Cows won’t even have to lower their heads to eat that. If they can catch up with it! 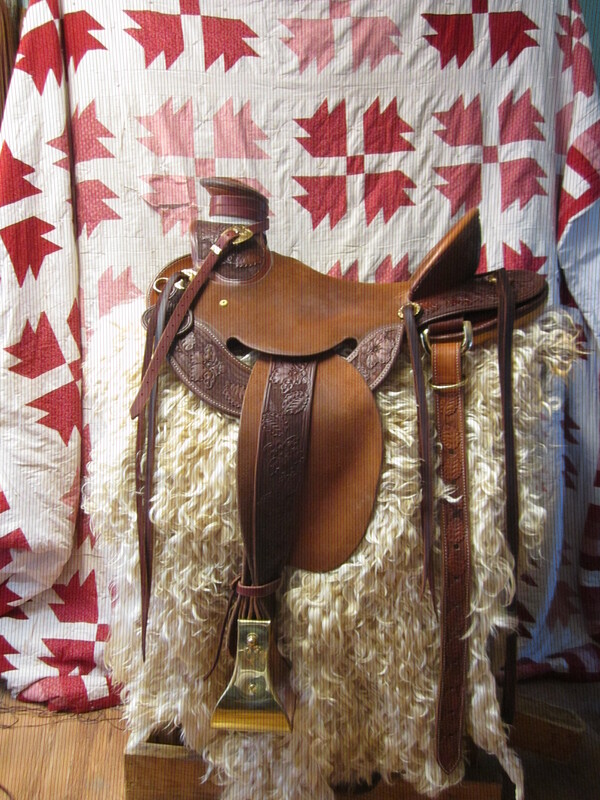 I’ve been working on the saddle, sewing the cantle binding this afternoon. My fingers are getting sore! Almost foggy this morning, but it burned off by late afternoon. The tire I had fixed on the pickup the other day was trying to go flat again, so after dinner I worked on my saddle a bit then drove it over to Punkin Center and they found another little hole. Sorry cheap tires! When I got home the sun was shining and the wind was going down so I worked Brody and the filly. Supposed to really blow hard tomorrow, so a good day to work inside when I get the cows fed. Steaks on the broiler for supper! Cool south east wind blowin’ this morning. Had to dress up warm to go feed. Didn’t work with colts today. Worked in the leather shop a bit and had some youngsters over and me and Paige jammed. Looks like we got some moisture headed this way. We’ll take it. I got this from Bud Williams website. Everyone ought to go there and read. so much knowledge about life and especially the life we as ranchers live. Here’s a good page to start on. Windy today and supposed to be tomorrow also. Imagine that…. After feeding this morning I aired up the rear pickup tire and went over to Punkin Center and had it fixed and also got some oil for the loader and had the oil changed in the pickup. Kind of a costly deal! Ate an early lunch at Bull Creek and visited with some young folks. They might come visit tomorrow and we will have a jam session. When I got home I had a short siesta and then went out and had a quick session with the two colts. Both went real well. I had drug a larger and heavier tractor tire into the corral this morning with the team and dropped off the smaller one. So when I hooked Wren and Ron she could feel some weight back there. Don’t know if it was that or just the progress, but it went real well. I also set the evener so she was pulling more than half the load. I didn’t work them too long, but it was a good session. If it was less windy I might have took a trip outside, but there is no hurry. Now for a shower and then Mass. Just a little this morning. Finally the sun cam shining thru’ around noon. When I put the dogs away last night you could really smell, wet. A good smell. Got the cows fed and had a good session with Brody. I had a flat on the rear of my pickup so I aired it up and let it set a half an hour to make sure it wasn’t too fast of a leak. I wasn’t so I drove over to Punkin Center to get it fixed. They were having their big open house at CBH so I couldn’t get it fixed, so i guess I just had a nice trip. I’ll probably drive over tomorrow and get it done. When I got home I worked with Wren and she had a good session. Then I have been working in the leather shop since.